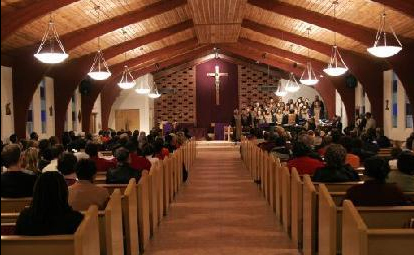 My church ….standing in the light. Happy, Blessed Easter Sunday to YOU! Well, I can’t wish you a Happy Easter, yet. Easter is very late THIS year! Have you read Paul VI’s prophetic encyclical Humanae Vitae? You did not mention the Church’s position on abortion but think the Church’s stance on birth control is “socially irresponsible, morally insupportable, and just plain nuts.” Are you aware of the connection between birth control, abortion and the degradation of woman? I hope you will study more of the Church’s wisdom and see that She is right. I honestly think that to speak out against birth control (let’s leave abortion out of it for now) and condoms in developing countries where HIV/AIDS and overpopulation are keeping people in abject poverty and at deadly health risk is morally irresponsible. Women need to be able to control their own health safety and their reproductive choices — anything less is degrading and puts them in a position of inferiority, in my opinion. But thanks so much for reading and writing! Catholics are not required to tithe, ask your priest. Happy Easter! Great comments about your church. I grew up a Catholic but was not as fortunate as you are. I hope the Church is getting past all the guilt, shame and exclusiveness I experienced when I was a a young boy. I love your goodness and your quest to clear a pathway through our jungle of mindless materialism. Society needs leaders who think and provide wise and useful alternatives to the mind-dead habits and foolish following of the money driven media. We need values to live by that nurture love, community, sharing, cooperation , honesty, giving, personal responsibility and encourage real happiness in society. Keep up the good, thoughtful and heart-filled work you are doing. Your thoughts are much more powerful and healing than you will ever realize.